This project was built into a small room located within the studio space that I had worked in for the months preceding this exhibition. The room’s doorframe was lowered and its width reduced so that a smaller scale door could be hung in place of the original. The new door was carefully fixed into a position (slightly ajar), allowing the viewer only a small slit of a couple of centimetres in width through which to see. The small space behind the door was dark, with indistinct, animalesque forms visible on its walls, which were barely illuminated by a small standard lamp. At first glance it was not evident that the door was open at all. 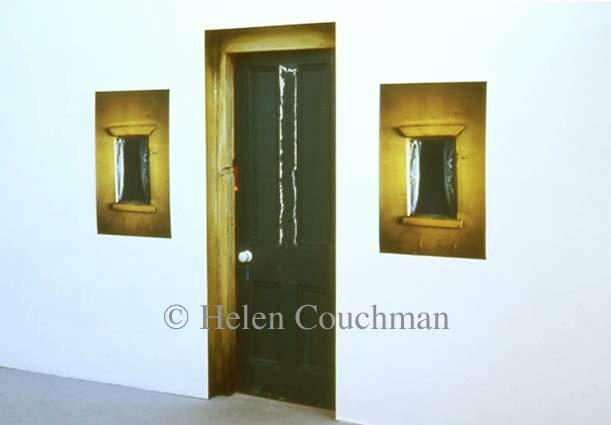 The components employed – the diminutive door, the large-scale of the doll’s house windows placed adjacent to it, and the small light visible through the door itself – all contributed to the ambivalence of the piece as a whole, one in which a combination of “readymade’ things, together with photographs of other objects were used to explore aspects of representation itself. My concern at the time lay, in this and other works, in what parts of the work the viewer was not easily able to see. Upon walking into the exhibition space the piece was directly on the viewer’s left hand side and it was not, at first glance, evident that the door was open at all. These small boundaries, allowing or disallowing access “into” the piece (whether physical or conceptual), interested me. A key issue here was our uncertainty as viewers of art works, particularly with respect to our physical relation to them. The work was also partly concerned with childhood recollections.